Why is Mulayam still in power ? When I came across this, I got a brain freeze for few seconds. And then storm of questions hit me. Is it the lack of education in UPites in general ? But then, is education so critical and fundamental that on an average , its absence causes people to make as ridiculous choices as Mulayam and clan? But then, there were those like Gaura Devi who never went to school, yet made name for themselves and their communities. Or is education after all, a necessary but not sufficient condition for people to chose wisely? 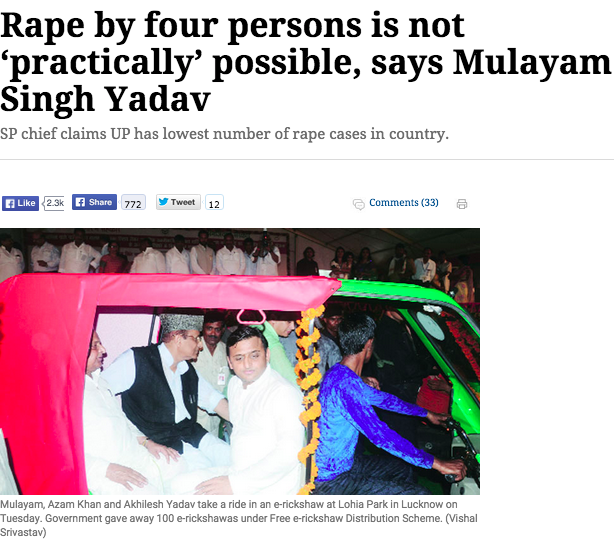 I am still struggling to find root cause of existence of Mulayams in power, in a state as humongous as UP. They say India has lot of diversity. What diversity is it that such a big mass of junta is choosing a jerk to lead them ? Diversity bas kapde aur khaan paan mein hi hai kya? Every kilometer , water and language change.. but way of thinking and choosing remains the same?